Another recipe i tried with the Beyond Meat Beef was Cousa. 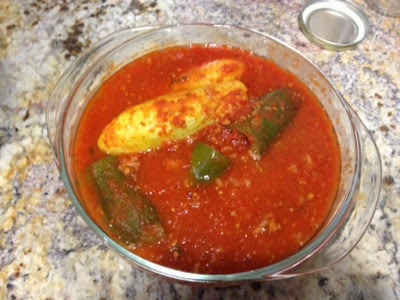 Cousa is a Lebanese dish with various veggies stuffed with a rice/meat combo. I mixed cooked rice and the Beyond Meat beef in a bowl. I cored yellow squash, zucchini, and peppers for stuffing. I boiled some cabbage to make cabbage rolls. I stuffed everything with the "beef" rice mixture. In a pot, put tomato sauce and the stuffed squashes. Let them boil for 45 mins or until tender. 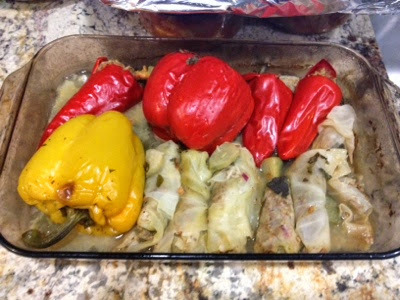 In a glass pan, put the cabbage rolls and peppers. Add water, lemon juice, and preferred spices just to cover the bottom by a few centimeters. Cover with foil and bake in the oven at 350f until tender.